This recipe is so simple and so good. It’s easy to make quickly or ahead of time. Ingredients: 4 apples – I like Honey Crisp. They are sweet, but have a little tangy-ness Cinnamon (0ptional) No seriously, that’s it. Chop apples into small 1/2 inch chunks. Steam for approximately 8-10 minutes or until fork tender. Reserve the liquid from steaming and use to smooth out mixture while blending. Add in a little cinnamon for flavor. Start with a quarter teaspoon and add more after tasting. That’s it! This is so simple and yet so good. It’s delicious as a side dish or served warm for dessert. If you want to get fancy, reserve some of the steamed apples and mix in with the blended for a chunkier version. You could also bake in a ramekin with a piece of puff pastry on top for a quick and easy version of apple pie. Enjoy! I modified a recipe I found last week and the result was fan-freaking-tastic! I love this dish, the flavors are so dynamic and it makes delicious leftovers. Serve it hot or eat it cold, either way it’s a winner. I’m giving amounts here more as a guide line. Add more of what you like and less of what you don’t! After the carrots are sliced, steam them gently with the snow peas. Combine liquid ingredients and scallions. Cook noodles and while still hot, add them to the liquid. Set aside. 1 small squirt (like 1/2 a teaspoon) of Siracha hot sauce. Go easy, this stuff is deadly. Also red pepper flakes will work. 30 ish shrimp. I buy cooked and thawed shrimp an then warm them in the dressing. This could be done with raw shrimp too, I just don’t have the patience to de-vein. I also think it’s gross. Combine liquid ingredients and bring to a simmer. Toss in shrimp and let cook until warmed through. Combine with noodle mixture and include the liquid from the shrimp bowl. Make a lot because you’re going to want this for lunch the next day. Enjoy! *On a side note – I was not a huge fan of the carrots and snap peas. The crunchy texture was not for me so I think steaming them will be good. But I had a FLASH of inspiration – cucumbers! Not sure if it’s going to work, but I think a couple of long skinny cucumbers on top of the completed dish are going to be fantastic! 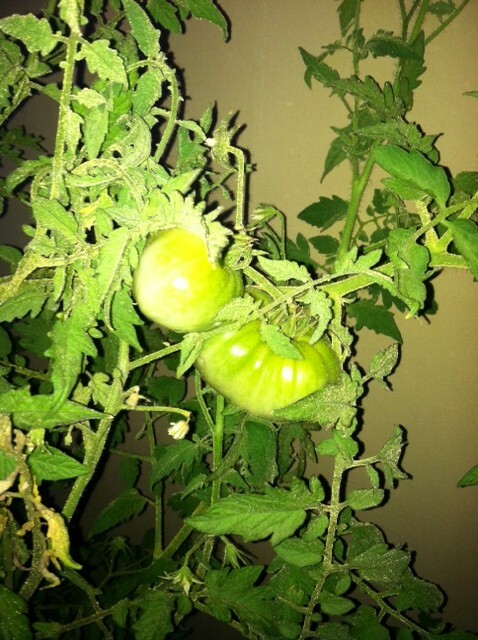 Some of our tomatoes are finally ready! Peter surprised me with a little appetizer the other night made of yellow tomatoes, shallots, mozzarella cheese and fresh basil. The mixture was served both chilled and also toasted on sourdough – delicious!! 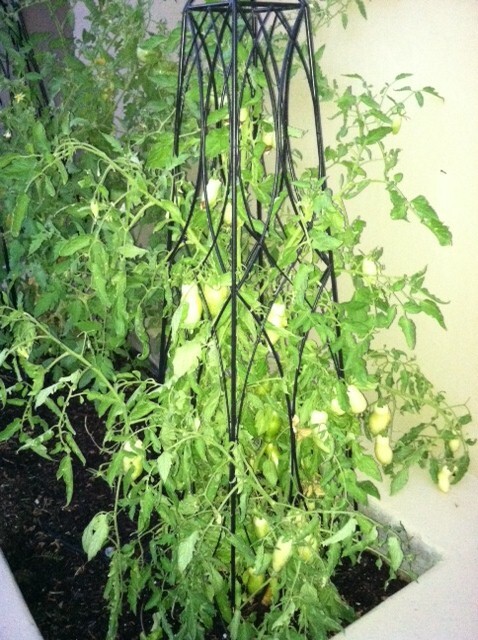 Peter’s mom, Marilyn, has a bountiful vegetable garden every summer and this one is no exception. She brought us great and HUGE zucchinis and lots of grape tomatoes, my favorite. Tomatoes are a no brainer, we eat them straight up, caprese salad, etc. But zucchini is always a toughie. Besides bread, I’m a little stumped. Feeling adventurous, I sliced the zucchini long ways into strips, about a quarter inch wide. Salt, pepper and a little fresh garlic and grilled them up. The result as delicious! The garlic gives them a little spiciness and they go great on the side of turkey ranch burgers. Ranch burgers are not my invention, but rather those at Hidden Valley. I tried the suggested recipe and the result is great. It’s an easy and fast dinner that even the munchkins like – 1 packet of dry ranch dressing and 1 lb of ground turkey. Mix well, form patties (go bigger, they shrink when cooked) and grill ’em up. Double the recipe and have plenty for lunch the next day. Also I’ve gotten a comment from a reader who I actually know and like (although his comment made me question our friendship) regarding the simplicity an often the use of ingredients that are pre-made (i.e. Lenten Deliciousness). This person questioned whether or not it should really count as a recipe when it is simple to make and my answer is this; when you have a toddler crawling up your leg, a sink full of dishes and a very small window before all hell breaks loose due to hunger and bed time, and you have to create a delicious and healthy meal, you call me and let me know if my “recipes” count as recipes. Ok? Tonight I tackle cake pops for Baylor’s family birthday diner tomorrow night. Pictures and play by play to come. Hopefully they are great pictures and a happy story and not something along the lines of the Whopper Brownies. When Baylie was a few months old, I received the Beaba Babycook gadget as a Christmas gift. If you have a baby, a grand baby or need an amazing shower gift for someone, this is it! I love this machine and have made countless meals for Ms.B and even a few delicious sides for Peter and I. Obviously at almost 2 years old, I don’t make as many things for Baylor in my favorite machine as often anymore. But I do steam carrots and I make a fruit mix for her yogurt. I always blend at least 3 fruits with a veggie. She chows it down daily not knowing that she’s actually getting her veggies with her delicious fruit. My favorite combo is an apple, spinach, strawberries and blueberries. But this week, I was out of spinach and not wanting to run to the store for just spinach, I tried to get clever. I had zucchini and brocoli. 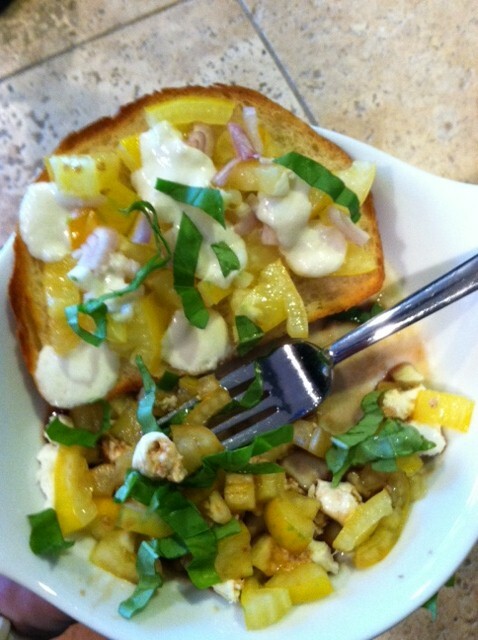 The zucchini was a no brainer – not a lot of flavor and would mix in with no detection. But the brocoli was a long shot. I was feeling gutsy so I went for it. When I sampled the final product, I did taste an overwhelming amount of strawberry, but just a hint of brocoli. Not a delicious combo. But I wanted to get the food critics opinion so I served up a bowl of yogurt to Bay and waited for the response. Rightly so, she turned her nose up after the first bite. Not willing to give up on my veggie filled mission nor an entire tupperware full of steamed and blended fruit, I got clever. 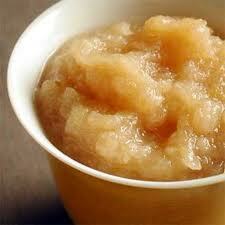 I mixed one of Bay’s favorite applesauce cups in with the fruit. And in a stroke of genius, I used the now empty cup to serve the new mixture. As soon as Bay saw the cup, she dug in. After her first bite, she gave me a raised eyebrow…and then gulped it down! Because it’s Lent, we’re not supposed to eat meat on Fridays. Because we’re not supposed to eat meat, all I want to eat is meat. I have honed this recipe over the last two Fridays and I ate so many tacos this past Friday night, I nearly grew gills. This is a super easy dish and it got rave reviews from my toughest food critic, Peter. Cook the fish according to instructions. Warm tortillas and layer with sour cream, fish, cheese, cabbage salsa and top with avocado. Roll up and dive in! At least 2 hours before cooking (the longer the better), put the steak in a dish and sprinkle with salt and pepper. Pour A1, teriyaki, Soy Sauce onto steak. Enough that there is some liquid in the bottom of the dish – go lighter with the A1 than with the Soy and teriyaki. Flip the steak – same salt and pepper and then spread the grainy mustard on. Add a little more liquid to this side. Cover and put in the fridge until you’re ready to cook. Depending on the thickness, broil or grill to preferred done-ness (if it’s a very thick steak, broiling can cause the marinade drippings to burn, thus making your house smell like steak for a few days). Wash and cut potatoes into equal sizes. Boil until fork tender. Mash with a good helping of salt and pepper, sour cream, butter, minced garlic and chives. Stir in a little shredded cheddar cheese. Sample along the way and add more of whatever you like best – the dish tastes best with lots of seasoning so go nuts. Put in a baking dish and top with a good portion of cheddar cheese. Bake for a few minutes at 350 degrees until the cheese is melted and getting bubbly. Slice the flank steak against the grain into long, thin strips. Serve with a heaping mound of potatoes and a big glass of wine. Enjoy!